The Czech LT-38 was one of the most successful products of the pre-war Czech armaments industry. Originating as a design in 1933, it was gradually improved so that by 1938 the latest version, the TNHP, was ordered for the Czech Army. Some 150 were ordered for the Czechs, while foreign orders totalled 200. 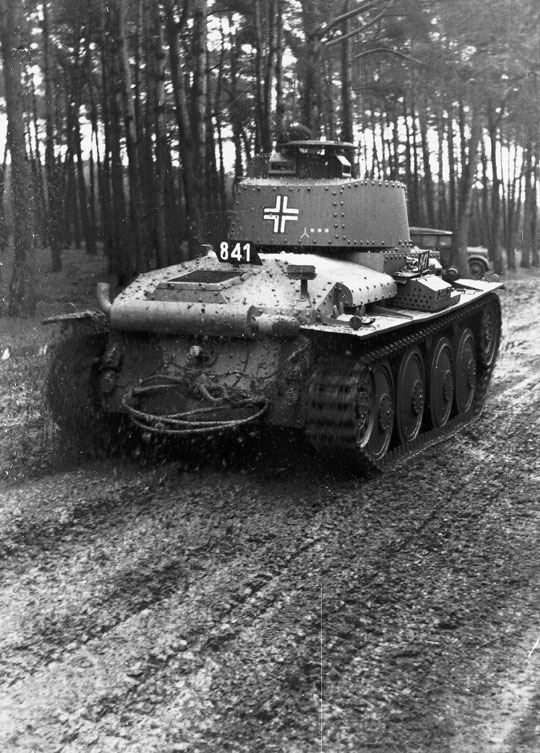 When the Germans took over the country in March 1939, they were pleased to have the tank and continued its production as the Panzer 38(t). They were soon issued to the 7th and 8th Panzer Divisions, and by 1941 this vehicle formed nearly 25 percent of the total Wehrmacht tank strength. The centrally placed turret, mounted on the roof of the fighting compartment, carried the Skoda 37mm A7 gun and a 7.92mm machine gun, while another machine gun was mounted in the front of the hull on the left-hand side. Rugged, reliable and easy to maintain, the Germans were happy to keep building the Panzer 38(t) until 1942, by which time a total of 1168 had been produced. By this date it was obsolete as a frontline tank, but the chassis continued to be used as a platform for self-propelled guns. Before the Germans seized Czechoslovakia, the vehicle was sold abroad or built under licence. In some countries it continued in service into the late 1940s.